Resource posts for my main blog (Extended Comments) and posts about things closer to home. Yet another ANZAC Day has come and gone. Prior to the day, I paused to think of what anniversary lies just two years ahead from now. On April 25, 2015, we will have the 100th anniversary of that day in 1915 when Australian and New Zealand troops landed at Gallipoli as part of a failed greater plan to seize the Ottoman capital of Constantinople (Istanbul in Turkey). British troops, including those from Australia and New Zealand, were there for over eight months. They grew to have a mutual respect for the Turkish forces. After over 8 months, it was decided the plan had failed, British forces, including the ANZACs, withdrew on January 9, 1916. Today, descendants of ANZACs and others can travel to Turkey to visit the sites of the battles. Each ANZAC Day, Turkey welcomes visitors to the site for a special service to remember those who died on both sides. For the 100th anniversary of the landing, there is so much interest in being there the area couldn’t fit them all. There will be a random ballot to decide who will attend. ANZAC is an acronym (a word formed from initials). It stands for Australian and New Zealand Army Corps. It was the name first given to the troops from Australia and New Zealand fighting in Gallipoli. ANZAC Day falls on April 25 each year. It was on April 25, 1915 ANZAC troops first landed in Gallipoli and the ANZAC legends began. 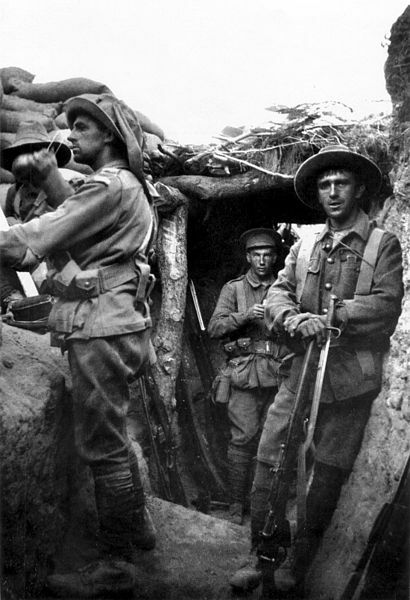 Below is a photo of Australian Soldiers in a trench captured from the Turkish troops August 6, 1915. This photo was sourced through Wikimedia Commons and is in the public domain. What does ANZAC Day mean to me? When I was growing up, it was a family tradition to attend the march through the streets of Sydney. My mother would take my two brothers and I by train into Sydney so we could watch my father march in the ANZAC Day march. He had been a soldier during World War II. After enlisting in the army and receiving his training, he was posted to Singapore with the 8th Division, 2/18 Battalion of the AIF (Australian Infantry Force). The Japanese attacked the city of Singapore and, despite the defence by Allied troops including my father, General Percival, the British officer in charge of the Allies, surrendered to save the people of Singapore from further suffering. My father became a Prisoner of War from 1942 until the war ended in 1945. The picture below was taken when I was in Singapore in 2010. 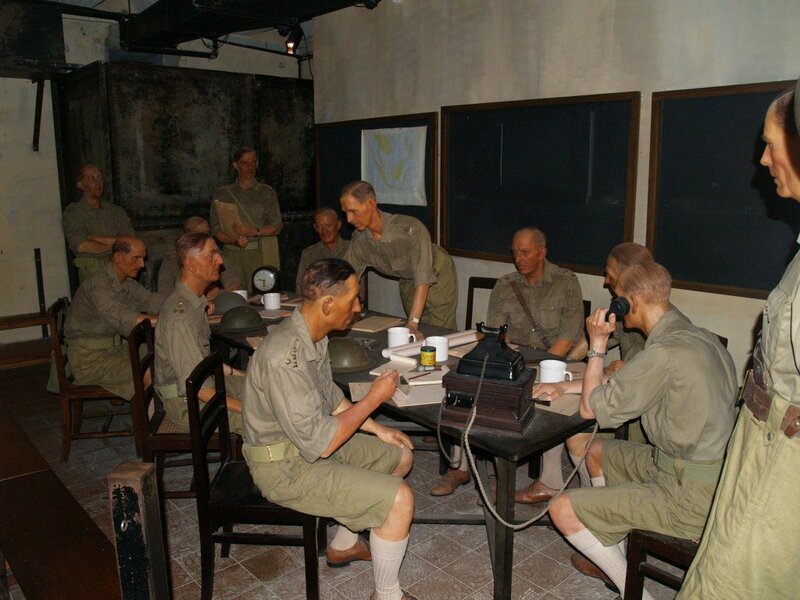 I visited “The Battle Box” where General Percival commanded allied forces up until the surrender to the Japanese in 1942. This was a life sized display showing the officers involved. My brothers and I would wait somewhere along the annual march route and try to be the first to see him coming. While I can’t remember them, veterans of the Boer War (1899-1902) were in the lead but eventually the last was gone and a riderless horse with boots reversed in the stirrups represented them. Next would come the veterans of World War I. I had a Great Uncle (the uncle of my father) in that war but he never returned from France. I remember the WWI veterans as proud and strong but in time, the last of them had passed. Great Uncle Ernie after enlisting in 1915. This photo cannot be used in any way without my written permission. After them, the World War II veterans, including my father, would appear. When we finally saw him, my brothers and I would cheer for him and he’d smile and wave. Slowly now the number of veterans of World War II are dwindling. My father passed in 1967 and few from his battalion are left to march. Had my father still been alive, he would have been 94. Veterans from Korea, Malaya, Vietnam (my brother had a friend in the Vietnam war) and other conflicts up to veterans from the most recent conflict in Afghanistan joined the marches over the years. For me, ANZAC Day, the Dawn Service and the march is a chance to remember my father, Great Uncle and others who served during wars. It’s not a time to celebrate war. It’s a time to remember the tragedy of war and the sacrifices so many had made. 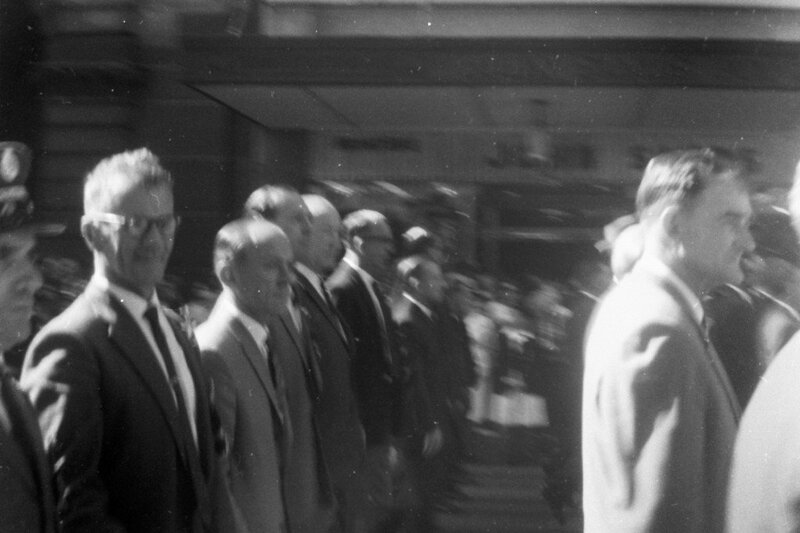 Below is a photo I had taken of my father when in the last ANZAC Day march he was able to attend back in 1967. This is the first time I have shared this photo. He is the nearest man with glasses. Viewing time: approximately 5 minutes. This video clip cannot be used in any way without my written permission. With such a clear day, crowds again were good. 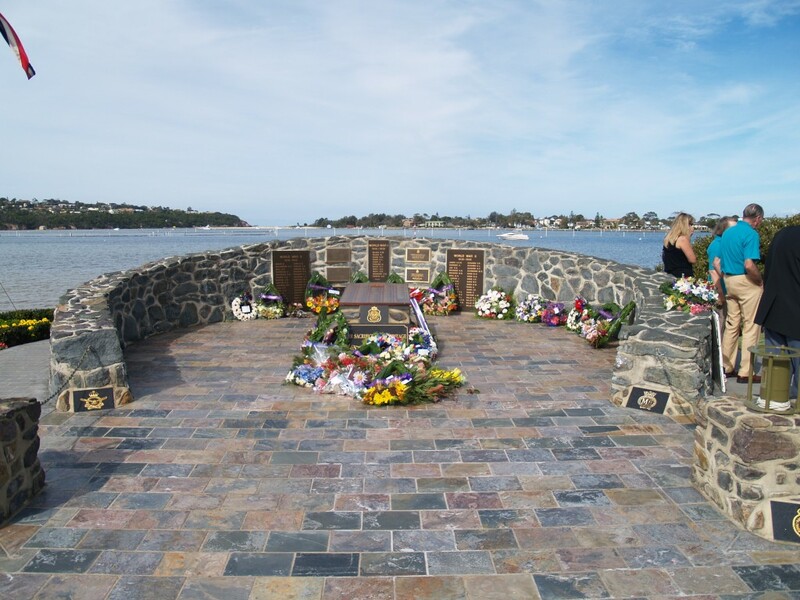 Below are the two part recordings of Pambula’s ANZAC Day March and ceremony. In order to conform to You Tube’s 15 minute limit per clip and keep the clips to two, the wreath laying portion has been edited out and some other edits have been made. Viewing time: approximately 15 minutes per clip. Below is the recording of Candelo’s ANZAC Day March. It does not include the ceremony. Viewing time: approximately 3 minutes per clip. In each march, students from local schools took part with representatives from the schools addressing those gathered. The schools will be given a DVD of the full marches and ceremonies they attended. May 27, 2013 is the U.S. Memorial Day. An online friend shared a link to a professional You Tube video clip entitled, “The Path of the Warrior”. It’s the story of U.S. people who have served but it can equally apply to our own who have served. The images from Life share the power of photography as we see “The Path of the Warrior” from WWI to recent conflicts. This embedded You Tube clip is not my work.